As we head away from the warm, summer days (well, when we can get them in Britain), we get plunged into the cold days of autumn and winter, where it gets dark by 5pm. Suddenly I find myself extremely unmotivated, and lacking much in the way of creative capacity. I also seem to once again long for those hazy summer days, where it was possible to drink tea not just because you need something to warm up your hands! Anyway, I digress. I've got two designs for you this time. The first with a very summer-y vibe, and the second with a... Norweigan coast vibe? I'm not really sure! Either way, neither cabin has any sort of facilities (aside from electric, which I would imagine to be solar-powered even if I haven't shown it), and is merely a shelter in a way. So first up, the beach cabin. Having had a holiday recently to Cornwall, and being able to walk along expanses of beautiful sandy bays and breathtaking cliff tops, it was only natural to start off with a beach hut. But I didn't want a normal beach hut, oh no! I wanted a fancy schmancy one! This tiny hut is decked out as a writers/artists retreat. Well, kind of. It has an architects drawing board in it, mainly because I thought it would be more versatile than a standard writing desk. There's also a 2m long sofa on the opposide side, with a lovely reading nook/bed on its very own side extension. Complete with a huge window to survey the surroundings and contemplate (if you so wish). Strangely though, I didn't add in a bookshelf anywhere... perhaps you could add one somewhere, or add storage in underneath the nook. Anyway, back to the aesthetics, and for some reason I really wanted it to be needlessly complex. I liked the contrast between the simple British beach hut, and the pompous architecture which actually I'm starting to appreciate more given how boring a lot of new build houses seem to look. (Oops, did I say that out loud?) Heh. I think the square cupola fits this level of pompousness nicely. I actually really love them. I guess it's the same way I'm a fan of clerestories and light scoops. Brings in (mostly) diffuse lighting, plus it's just a nice feature to have, especially if it's big enough to pop your head up into and see out. You could have a hard time trying to do that here, even though the ceiling is low. Another feature I really love is exposed framing. I.e. where all the insulation is outside of the wooden framing that makes up the basic shell of the structure. You'll probably have seen this in a few of my designs - this one is no exception! For such a small building (6.3 square metres), it's surprisingly complex. Although it's mainly a basic pitched roof, both sides have an extension with a lower roof angle. That's on top of the rear cat-slide extension, and of course the cupola! The whole hut also features an abundance of glass (on 3 sides, plus the cupola on all 4 sides), and the whole structure sits off the ground on a wooden frame about 600mm high. All surfaces are painted white, with the only exception being the white/grey/green sofa and pendant lights. What the hut lacks in size and ammenities, it makes up for in natural light, cosyness, and charm! Alright, so moving onto the Norweigan-esque cabin! You may remember a previous design of mine - the cantilevered studio and cabin, which was also of a similar colour scheme; the very trendy charred black wood exterior with the white-painted wooden interior. Well, this is a sort of nod to that design, albeit this time there is a distinct lack of ammenities! Oh, and also I feel it's a bit more interesting to look at. So a quick tour (shouldn't take long! ); the entryway is under an overhanging roof, where there is a built-in bench on the decking with storage below. Opening the glazed door, you have a fitted reading nook/guest bed on the immediate right which gets wider the further in you get. 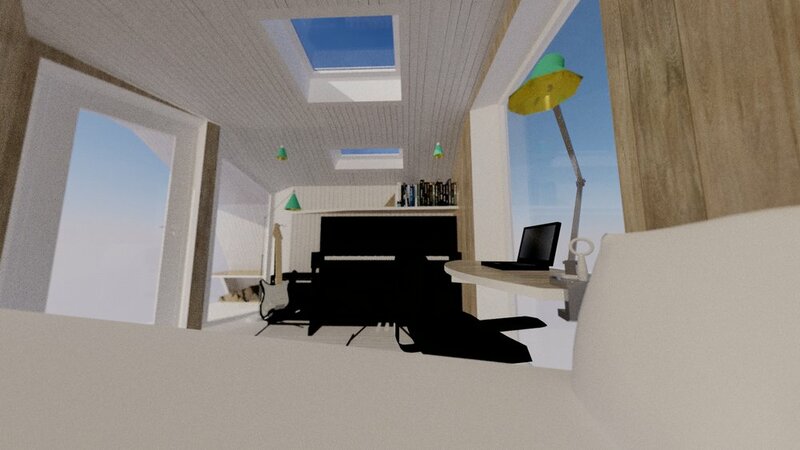 At the far wall is a full height window with a built in desk with which to enjoy the view from. And aside from the bookshelf on the left most wall, the rest is open to put your own furniture in. In this example I took a break from using my own furniture and instead turned it into a music practice room (using Sketchup's musical instrument models). In reality you could use the room as you desire. I feel like this has a little more versatility than the beach hut, mostly because I feel like the structure aesthetic would fit in more locations than a beach hut with a cupola would! And if you wanted, perhaps you could add a kitchenette instead of the piano, and have a small seperate building outside for a toilet. It's also more of a sculptural design than any of my previous ones, with those angled walls and roof surfaces. I really like that it's not a boxy design, and whilst it doesn't have curves, it's a design that's not afraid to step away from boring right angles. I also feel it's more of a playful design than my others - especially with the second bench on the side of the structure hidden by two overhanging roofs. And so that about ends our tour of my latest two cabin designs. Both very different, but still comfy and bright and airy - making the most out of natural light. Let me know what you think in the comments below!